Vacation rental house. Sleeps 8, 4 bedrooms, 3.25 bathrooms. Dogs allowed. You and your family will love the location and features of SM#197. It is a spacious 2208 sq.ft. and is a wonderful family vacation home with four bedrooms and three and one-half bathrooms. Just a stone's throw away from the bike path and then 5 minutes away from the Glaze Meadow Recreation Center, you can enjoy the indoor and outdoor swimming pools, spa, bike rental, playground, tennis courts, snack bar, etc, without ever getting in your car! Ideal for two families, SM#197 has a king bedroom with a bath across the hall and a large newly added master suite off the dining area downstairs. The living room is open to the dining room and is comfortable with a wood burning fireplace and a leather sofa and love seat. The updated kitchen is spacious with miles of cabinets and countertops. Ask all the family members to help with dinner in this roomy kitchen! A newer full size washer and dryer is available to renters by the entry. Head upstairs to the right and a bedroom with two twins and a queen bedroom and full bath are at the top of the stairs. A loft area with a tv is an added bonus room for the kids to enjoyas a separate place to be together and watch movies. Go the opposite direction up the stairs to a third living and relaxing family room, complete with a desk for your laptop and a game table for those poker or monopoly nights. 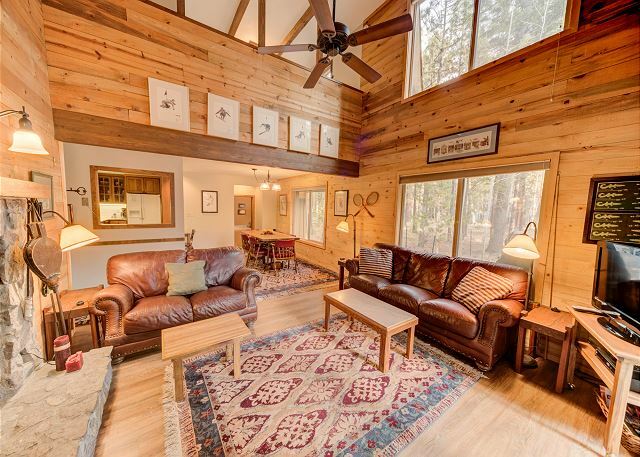 A gas burning stove will take the chill off on those cool Black Butte evenings. A 1/2 bath is conveniently located off the family room. Lots of windows bring light into this room which is comfortable and welcoming. The front deck has a small table for your morning coffee and the back outdoor area is lovely and private with a large deck and aspen trees. This area will provide your family an ideal area for those evening BBQ's after a long day filled with lots of activity and fun. A garage is available for your bikes and golf clubs and wireless internet will allow you to keep in touch with your family and friend. 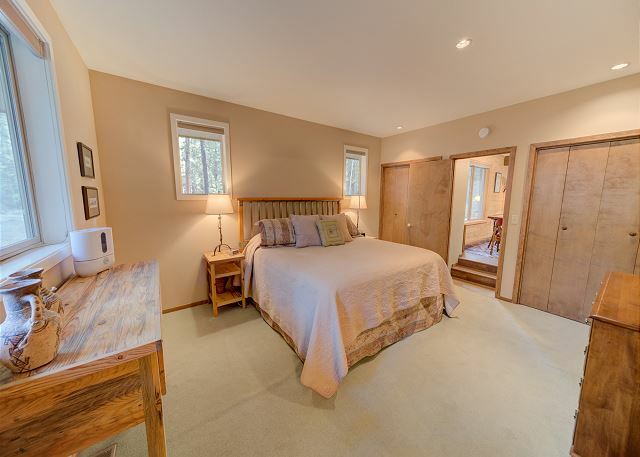 All in all, you will want to make this your home away from home at Black Butte Ranch. Portable AC's available for rent while there is supplies on hand. We really enjoyed our stay this past Christmas. We chose this house because of the kitchen, its huge and well appointed. It is on a quiet cul-de-sac, we were the only occupants in the area for the holidays so it was great. It was great to have the 2nd family room/den area so people could read or do a puzzle away from the action happening downstairs. We are happy to year you enjoyed your stay at SM-197. Thank you so much for your review! Very nice. Good condition, and nicely appointed except for needing more sharp knives. Wish the living room had been bigger for games. This house worked great for our three families. The layout was very accommodating giving each of us separate space. We enjoyed the outdoor deck and bbq. Because of the season, Black Butte was pretty quiet which was very nice and the weather was warm enough to be out but not too hot. Please have maintenance check upstairs shower for leaks around the shower door. If it continues carpet and floor will be ruined. needs new caulking! Very impressed with how clean and comfortable this rental was. Kitchen is stocked with everything you will need. Beds were comfortable. Great separation of space. The folks at Howells were extremely accommodating and considerate. They warned us about the smoke before our arrival and at our request, quickly shipped some clothing back to us that we had left in a dresser. wonderful; all fives. If something needed attention, Howells promptly attended to it.